Synthetic peptide within Human SUN2 aa 700-800 (C terminal). The exact sequence is proprietary. WB: Human fetal muscle, Saos-2, HeLa, Jurkat and HepG2 lysates. IHC-P: Human lung and ovary tissues. Flow Cyt: HeLa cells. Our Abpromise guarantee covers the use of ab124916 in the following tested applications. WB 1/1000 - 1/10000. Predicted molecular weight: 80 kDa. IHC-P 1/250 - 1/1000. Perform heat mediated antigen retrieval with Tris/EDTA buffer pH 9.0 before commencing with IHC staining protocol. SUN proteins form part of the LINC complex - a protein bridge that spans the nuclear envelope linking the nucleoskeleten to the actin cytoskeleten. They are located on the inner nuclear membrane side of the complex. The LINC complex is thought to function in controlling nuclear position, contributing to mechanical resistance and the overall architecture of the cell. SUN2 can exist in a heterodimer with SUN1. Both can interact with lamins and nesprins in the nuclear envelope. Nuclear membrane, endosome membrane, mitotic spindle organization. ab124916 staining SUN2 in mouse testis tissue sections by Immunohistochemistry (IHC-P - paraformaldehyde-fixed, paraffin-embedded sections). Tissue was fixed and paraffin-embedded, antigen retrieval was by heat mediation in Tris/EDTA buffer pH9. Samples were incubated with primary antibody (1/500). An HRP-conjugated goat anti-rabbit IgG, ab97051 (1/500) was used as the secondary antibody. Tissue counterstained with Hematoxylin. PBS was used in the negative control rather than the Primary antibody. Flow cytometry analysis of HeLa (human cervix adenocarcinoma) cells labeling SUN2 (red) with ab124916 at a 1/30 dilution. Cells were fixed with 80% methanol and permeabilized with 0.1% Tween-20. 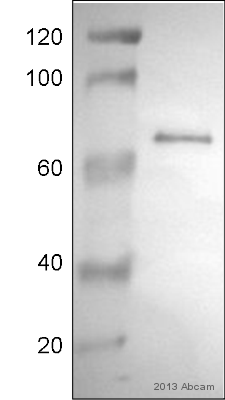 A goat anti-rabbit IgG (Alexa Fluor® 488) (ab150077) was used as the secondary antibody at a 1/2000 dilution. Black - Rabbit monoclonal IgG (ab172730). Blue (unlabeled control) - Cells without incubation with the primary and secondary antibodies. ab124916 staining SUN2 in Human colon tissue sections by Immunohistochemistry (IHC-P - paraformaldehyde-fixed, paraffin-embedded sections). Tissue was fixed and paraffin-embedded, antigen retrieval was by heat mediation in Tris/EDTA buffer pH9. Samples were incubated with primary antibody (1/500). An HRP-conjugated Goat anti-rabbit IgG, ab97051 (1/500), was used as the secondary antibody. Tissue counterstained with Hematoxylin. PBS was used in the negative control rather than the Primary antibody. ab124916, unpurified, at a 1/250 dilution, staining SUN2 in paraffin embedded Human ovarian tissue by Immunohistochemistry. ab124916, unpurified, at a 1/250 dilution, staining SUN2 in paraffin embedded Human lung tissue by Immunohistochemistry. Publishing research using ab124916? Please let us know so that we can cite the reference in this datasheet. Looking for LINC components in mouse fibroblasts. Does this SUN antibody work for immunolocalization (it says so but I don't see cell image)? Can you recommend any LINC-specific antibodies to use for immunolocalization with F-actin? ab124916 tested positive on HepG2 cells in ICC, however, the laboratory did not save the image.